Nature`s Answer Sambucus Kid`s Formula is an all natural dietary supplement that is ideal for seasonal support. 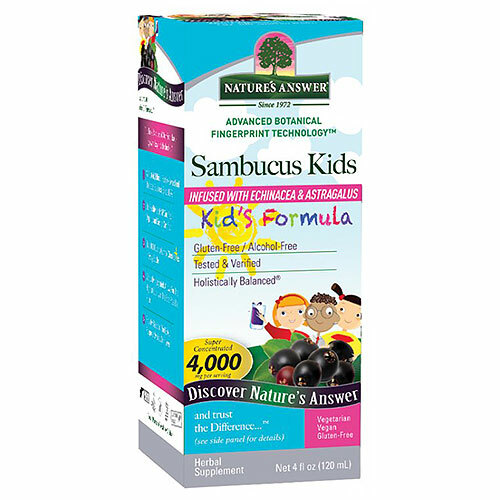 Sambucus Kids Formula combines black elderberry with organic echinacea and organic astragalus for gentle, enhanced immune support. Organic agave nectar insures a pleasing, smooth taste, with no artificial ingredients. Sambucus nigra L. is the Latin name for Black Elder. The dark blue/black berries of this plant have many naturally-occurring nutritional substances such as Rutin, Quercetin (flavonoids) and Anthocyanins. Current research supports the long held beliefs about elderberry`s health benefits on the body. Elderberry syrup has been traditionally used to help support the immune system, especially during the winter season or when experiencing extra stress. Nature`s Answer alcohol-free extracts are produced using alcohol, water and natural extractants. All alcohol and extractants are then removed through their Bio-Chelated proprietary process, yielding a Holistically Balanced standardised extract. Holistically Balanced guarantees that the constituents of the extract are in the same synergistic ratios as in the plant. Black Elderberry Juice Concentrated Extract, Proprietary Herbal Blend (Echinacea purpurea Aerial Parts Extract, Astragalus Root Extract, Echinacea angustifolia Root/Rhizome Extract), Red Raspberry Juice Concentrated Extract, Organic Agave Syrup, Glycerin, Purified Water, Citric Acid. As a dietary supplement, for adults and children four or more years of age, take one teaspoon 3-4 times a day in a small amount of water. Shake well before use. Below are reviews of Nature`s Answer Sambucus Kid`s Formula - 120ml by bodykind customers. If you have tried this product we'd love to hear what you think so please leave a review.